Sainted Leo I the Great, Pope of Rome (440-461), received an exceedingly fine and diverse education, which opened for him the possibility of an excellent worldly career. But his yearning was in the spiritual life, and so he chose the different path of becoming an archdeacon under holy Pope Sixtus III (432-440) – after whose death Saint Leo in turn was chosen as Pope of the Roman Church, in September 440. These were difficult times for the Church, when heretics besieged the bulwarks of Orthodoxy with their tempting false-teachings. Saint Leo combined within himself a pastoral solicitude and goodness, together with an unshakable firmness in questions of the confession of the faith. He was in particular one of the basic defenders of Orthodoxy against the heresies of Eutykhios and Dioskoros – who taught that there was only one nature in the Lord Jesus Christ, and he was a defender also against the heresy of Nestorius. He exerted all his influence to put an end to the unrest by the heretics in the Church, and by his missives to the holy Constantinople emperors Theodosius II (408-450) and Marcian (450-457) he actively promoted the convening of the Fourth OEcumenical Council, at Chalcedon in 451, for condemning the heresy of the Monophysites. At this OEcumenical Council at Chalcedon, at which 630 bishops were present, there was proclaimed a missive of Saint Leo to the then already deceased Sainted Flavian, Patriarch of Constantinople (447-449). 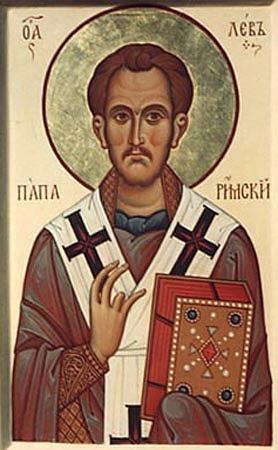 Saint Flavian had suffered for Orthodoxy under the Ephesus "Robber Council" in the year 449. In the letter of Saint Leo was posited the Orthodox teaching about the two natures [the Divine and the human] in the Lord Jesus Christ. And with this teaching all the bishops present at the Council were in agreement. The heretics Eutykhios and Dioskoros were excommunicated from the Church. Saint Leo was likewise a defender of his fatherland against the incursions of barbarians. In the year 452, by the persuasive power of his word, he stopped a pillaging of Italy by the dreadsome leader of the Huns, Attila. And again in the year 455, when the leader of the Vandals [a Germanic tribe], Henzerich, turned towards Rome, he boldly persuaded him not to pillage the city, burn buildings, nor spill blood. He knew about his death beforehand and he prepared himself by ardent prayer and good deeds, for the passing over from this world into eternity. He died in the year 461 and was buried at Rome, in the Vatican cathedral. His literary and theological legacy is comprised of 96 sermons and 143 letters – of which the best known is his missive to Saint Flavian.